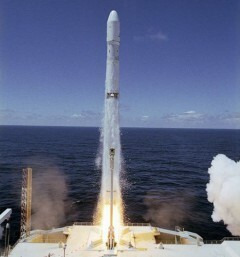 Almost seven months to the day since the loss of a Zenit booster, which fell into the Pacific Ocean less than a minute after its 1 February liftoff, the Sea Launch international launch services provider and its subsidiary, Land Launch, has achieved a remarkable success by placing Israel’s AMOS-4 communications satellite safely into orbit. Liftoff of the three-stage Zenit-3SLB vehicle occurred from Site 45/1 at the Baikonur Cosmodrome in Kazakhstan at 2:05 a.m. local time Sunday (4:05 p.m. EDT Saturday). Boosted by the Zenit’s two core stages, and supplemented by the restartable Block-DM upper stage, the injection of AMOS-4 into orbit was confirmed a little over five hours after launch. Since March 1999, Sea Launch has staged 35 missions from mobile maritime platform in the Pacific Ocean … and since April 2008 its subsidiary, Land Launch, has completed six successful missions from Baikonour (Credits: Sea Launch). Since the first flight in March 1999, Sea Launch has thus enjoyed 35 missions, with three outright failures. 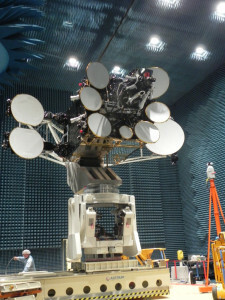 It has launched payloads for the United Arab Emirates, Japan, South Korea, and Italy, and has carried satellites for the International Telecommunications Satellite Organization (INTELSAT), The International Maritime Satellite Organization (INMARSAT), and the European Telecommunications Satellite Organisation (EUTELSAT). A EUTELSAT mission is currently scheduled to fly aboard the next Sea Launch in April 2014. Alongside Sea Launch, a Land Launch campaign of the Zenit has proceeded with a series of missions from Baikonour Cosmodrome’s Site 45/1. First flown in April 2008 with Israel’s AMOS-3 communications satellite, the Zenit-3SLB has also delivered Telstar-11, a pair of large INTELSAT payloads, and the MEASAT-3A mission into orbit. Yesterday’s launch of AMOS-4 thus marks the sixth Land Launch from Baikonour and the 41st total flight undertaken by the Sea Launch organization. Unlike the Pacific-based maritime launches, the Baikonour-based launches can insert payloads directly into 22,600-mile geosynchronous orbits, rather than transfer orbits. The Zenit used in last night’s mission has a long and storied history that stretches back more than three decades. Developed by the Yuzhnoye Design Bureau of the former Soviet Union, it utilizes a Zenit-2SB core vehicle, coupled with a restartable Block-DM upper stage, and weighs about 930,000 pounds at liftoff. The total stack stands about 192 feet tall. Its first stage is powered by a single RD-171 engine, with a propulsive yield of 1.8 million pounds. At 2:04:55 a.m. Baikonour time Sunday (4:04:55 p.m. EDT Saturday), the engine ignited and the vehicle left Site 45/1 about five seconds later at T-0. Fueled by RP-1—a highly refined form of rocket-grade kerosene—and liquid oxygen, the RD-171 burned for 150 seconds, after which it separated and the second stage resumed the push toward orbit. The Zenit-3SLB’s second stage employs RD-120 and RD-8 engines, which produced a combined 223,000 pounds of thrust and burned for about 315 seconds. The Block-DM and attached AMOS-4 payload separated at 2:13:29 a.m. Baikonour time Sunday (4:13:29 p.m. EDT Saturday), preparatory to three “burns” over the next six hours. The first burn lasted four minutes, after which the stack coasted for an hour, ahead of a second burn lasting six minutes. The engine shut down for the second time at 3:25 a.m. Baikonour time Sunday (5:25 p.m. EDT Saturday), and the combo coasted for another five hours. The final burn, lasting about a minute in duration, began at 8:38 a.m. Baikonour time Sunday (10:38 p.m. EDT Saturday). Eleven minutes later, AMOS-4 separated from the Block-DM and preparations began to deploy its solar arrays and communications appendages. Developed by the Energia Corporation, the Block-DM carries a single-chambered RD-58 engine, capable of 19,100 pounds of thrust. Originally conceived in the late 1960s as an upper stage for Russia’s ill-fated N-1 lunar rocket, the Block-DM is restartable up to three times in flight and measures 18.7 feet long. Yesterday’s launch campaign was executed smoothly, following two months of processing at the Baikonour site. The Zenit arrived in late June, and on 21 August the AMOS-4 satellite was transferred to the Area 42 Assembly and Test Facility for integration with the booster. The entire stack was rolled out to the launch pad on the 29th. The launch of AMOS-4 marks the 39th mission from Site 45/1, which is now the only operating member of what was originally a two-pad complex; Site 45/2 was utilized twice, but suffered heavy damage in an October 1990 launch explosion and has since remained unused. The AMOS-4 payload undergoes pre-flight testing (Credits: Israel Aerospace Industries). AMOS—the name is actually an acronym for “Affordable Modular Optimized Satellite,” although its tribute to the 8th-century-BC Jewish prophet Amos is inescapable—was conceived by Israel Aerospace Industries and is operated by Spacecom. When AMOS-1 was launched aboard an Ariane 4 rocket from Kourou, French Guiana, in May 1996, it became the first Israeli communications satellite. Operating for more than a decade at 4 degrees West, it provided home television services across Israel and Europe, before it was sold to INTELSAT in 2009, who have since moved it to 47.3 degrees East and rented it for U.S. military communications in the Middle East. Seven years later, in December 2003, a Soyuz rocket launched AMOS-2 from Baikonour, also into the 4 degrees West position, to create a common location and help increase user abilities without the need for additional antennas. The second satellite covered the Middle East, Europe, and the United States’ eastern seaboard. Now coming to the end of its tenth year in orbit, AMOS-2 will be replaced at the 4 degrees West orbital “hot spot” in 2015 by AMOS-6. The latter will be launched by SpaceX’s Falcon 9 rocket, following contractual agreements signed earlier this year. After AMOS-2, the third and fourth satellites in the constellation quickly followed. AMOS-3 was launched aboard the first Zenit Land Launch mission in April 2008. It entered AMOS-1′s old slot at 4 degrees West as a replacement for the old satellite. More recently, AMOS-5 flew in December 2011 and is presently stationed at 17 degrees East. Although numerically launched in the wrong order, AMOS-4 is destined for emplacement at 65 degrees East. When operational, it will exploit multiple Ku-band and Ka-band transponders to enable a wide range of cross-band and cross-beam connectivity options. Its two steerable Ku beams cover Russia and India—with options to expand across Southeast Asia, the Middle East, Central Asia, South Africa, and Central Europe—and its single Ka beam covers the Middle East. AMOS-4′s enhanced capabilities are expected to deliver television broadcasts and broadband internet service into urban and more rural areas. AmericaSpace was founded in 2009 by two former aerospace engineers. Since then, this site has been dedicated to reporting on the state of America’s space and aerospace efforts, which for many have been, and remain, synonymous of America’s willingness, indeed enthusiasm, to reach new horizons. As America’s human space flight program transitions from the Shuttle program to one focused on beyond earth exploration, AmericaSpace will continue to cover this evolution in spaceflight while expanding our coverage of aeronautics, milspace, and planetary exploration. We do this for one simple reason… Because America is a nation that explores.